A rural gem in fast-growing unincorporated Northern Palm Beach County, Caloosa is an equestrian’s dream. The community boasts more than 30 miles of interior bridle paths, a 32-acre horse park, paved roads, close proximity to exclusive shopping, world-class golf, a small airport and state-of-the-art medical facilities. Small wonder it is home not just to horse lovers, but recreational enthusiasts of all ages. Caloosa is conveniently located on SR 710 (BeeLine Highway) north of PGA Boulevard and south of Indiantown Road. The community comprises 350 five-acre parcels, each adjoining the internal trail system. Amenities at Caloosa Park include tennis and basketball courts, heart trail, fenced kiddy park, riding arena and jump course. A small meeting facility, screened picnic pavilion and barbecue grill are also available, and can be reserved by residents for private parties. 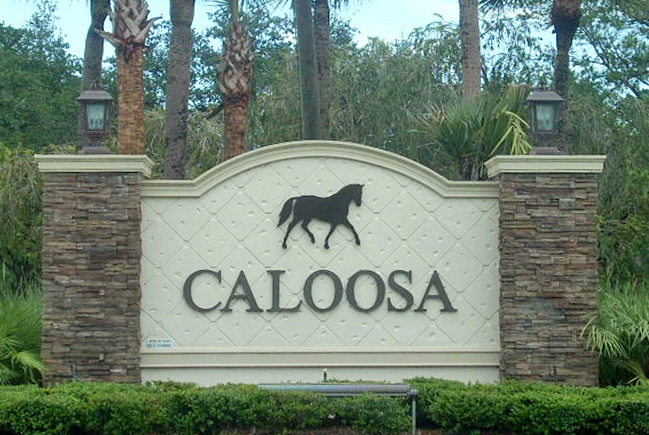 Platted in 1978, Caloosa is governed by a Homeowners Association with a seven-member Board of Directors. Kings Management provides on-site property management services. Association fees are assessed at the rate of $2,400 annually, with occasional special assessments. Palm Beach County provides municipal services such as law enforcement, fire-rescue and solid waste pick-up. Each owner is responsible for installing and maintaining a private well and septic system. Information regarding County taxes can be obtained by contacting the Palm Beach County Tax Collector. The Caloosa Board of Directors meets at the Pavilion the third Thursday of the monthly at 7pm The Annual Meeting is conducted the third Thursday of September. Equestrian Committee Meetings are held the 2nd Tuesday of each month at the Pavilion at 7:00pm. As we enter into the active alligator season please use caution when you, your children or your pets are anywhere near the canals. The licensed trapper for the Caloosa area has recently removed five gators over 5′ long and one over 7′. You may see the trapper working at night because it is easier to find the gators by using a spot light because their eyes reflect the light. The trapper should always be in a marked vehicle when in the community. Due to funding cut backs the County is not planning on spraying as often as they usually do each year. However, the more residents that call and complain the more likely it is that they will spray our area. Caloosa residents are encouraged to sign up with the ICE (In Case of Emergency) Program in Palm Beach County. Whether you are a private homeowner installing a mailbox, or a professional contractor digging up a city street, you are required by law to notify your local One Call utility notification center 48 to 72 hours prior to digging. For those who don’t remember and for new residents, it is important to know that during a hurricane, Caloosa is totally self-sufficient. We have no police, fire, or ambulance services available. CERT members will be going door to door after the storm has passed to check on residents’ wellbeing. In addition, the First Responder Team will be available during the storm for any and all needs that involve life-threatening situations to people and animals. This is only available for extremely serious conditions. After the storm, please help to identify downed power lines, trees on power lines, and any other serious damage. Call Bruce King at 561-627-0480 report problems. I have also arranged for the Shell Station to leave the pump closest to the Beeline available to Caloosa residents after hours with the use of a credit card. This will avoid waiting in long lines when the station is open to the public. For emergencies, please call Carl on his cell phone listed below. “Whether you are alone, a small family or large community/business, there are plenty of options available here to help yourself and others become better prepared…” Read more at the ICE Website. Loose leaves, grass clippings, or pine needles must be containerized or bagged. Household trash must be separated from vegetative yard waste and placed separately at curbside. Materials must be located within 6 feet of curb. Materials must not be greater than 6 feet in length or greater than 50 pounds.